The tower climbing industry is more diverse than most people realize. In fact, there are a lot of people who don’t give a second thought to being able to text or get online… until they can’t. Frequently, the focus of these blogs has been on those who climb. Several other individuals play important roles, the managers, the welders, the clients, those who take the calls, and the boom crane operators. 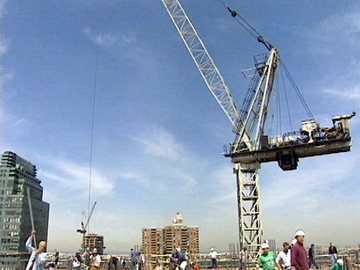 Boom cranes have become so important to construction and to the construction of towers. This is a good specialty to get into if you develop a fear of heights or can no longer climb for medical reasons. Without the aid of the boom crane, there is a lot that would not be possible. Can you imagine trying to drag a welder or compressor up to the top of a tower? It would be impossible and impractical. This is also a great skill for any person to possess as it is highly in demand all over the world. Most of the people who run a boom crane also have another job that they fulfill. It makes economic sense. There is no reason to higher a guy who can only perform one task when there are those who have multiple skills. In any given shop, the role of boom crane operator will fall to whoever has the qualifications. This means that the job may fall to a seasoned climber or a novice. Even supervisors will step in if they are the only one who can. Anyone who operates a crane which has a capacity over 2,000 pounds has to be certified by a crane operator testing organization which is accredited. Even if you are never lifting that much weight if your crane could, then you need certification. This accreditation is handled by organizations which follow the rules of OSHA. One of the largest programs is the National Commission for the Certification of Crane Operators, the NCCCO. Crane Operators who have their CCO certification meet the qualifications of OSHA, and, therefore, the NCCCO. While undergoing the certification to become a licensed boom crane operator, an individual can still operate the crane as an “operator-in-training.” They must remain under the direct supervision of their trainer, but it is the best way to get the feel of the crane. It should be noted that those who have undergone crane operator while in the military (Option 3) will not be certified under OSHA’s standards. The additional training must be finished before a certification can be completed. Many employers are making it easier for climbers to obtain the additional boom crane certification by allowing training programs to be taught on or near the location. It is never one individual who is responsible for the construction and maintenance of a tower. It is a team, a crew of individuals all putting their skills together to accomplish a goal. As a result, the world keeps running, people keep posting, and knowledge is shared globally.